A reader sent a link to an extraordinary collection of photos entitled Why Men Die First. Yikes. Hey! How'd you get 'my picture'? Sometimes you gotta git 'er done! What we men won't do for you women! Hope the wives have lots of life insurance on them.At least then she can have a good time after they git 'er done. We men have watched way too many episodes of "Walker Texas Ranger." We watch Chuck Norris jump out of helicopters, wrestle grizzly bears and safely land disabled jumbo jets--and live!--and we think we can do silly stuff like that too. Chuck Norris Syndrome (CNS) should be recognized by the AMA! I wonder what color ribbons the Hollywood celebs would wear to raise awareness for CNS? NOW I unnerstand!!! But to be honest, I bet someone could find plenty of pix of women doing some pretty dumb stuff. I grew up with 4 sisters and a mom, and I've reared 3 girls and been with the same woman for 43 years. I know gals do plenty of dumb stuff, it just isn't politically correct to knock women these days! I always thought it was "...because we want to." Just wait until I have to put up the new stovepipe for the wood stove this fall. Underneath the foolishness on the surface, is really the nobility of fearlessness. 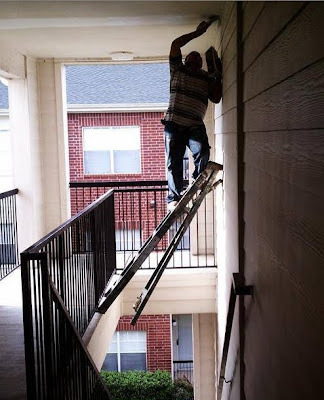 ha ha, no one said men were always smart, their testosterone takes over at times causing them to do things like this. :)trust me, when my hubbie was courting me he decided to jump off the balcony in his studio and landed his booty on a glass door and thus sliced it open, oh the joys of men! Heh. SwampMan looked at the pictures, and said "So what's wrong with that?" It is true of course. I don't know if it is testosterone or peer pressure or something else but men take chances and do indeed believe they can do almost anything. The upside to this is that almost everything, every discovery, every invention, everything useful is a result of men. I know, I can hear it now. Every woman out there is offended. Take it for what it's worth. Men are hunters, protectors and problem solvers. Women are nurturers. We, the world, need both. Sadly a lot of men have died hunting, protecting and problem solving. In general these things are dangerous. Those who make it past 35-40 or so learn how to accomplish these things in safer ways. If you want an army to protect the nation then hire or conscript young men but the leaders should be older and proven themselves to be survivors. 11:47am - so true. Sent this to my mom who replied with "Yep, I remember bracing the ladder like that while painting an upper wall in our first house..." LOL! And don't ask my hubby about why he had to hide the power tools when I was 9 months pregnant and going into full-blown nesting mode!